The world of conferences is changing before our eyes. The experience for the participant is no longer about a nice hotel, rounds of golf, and a celebrity speakers. People want more. Attendees do not simply want to attend an event, they want to be part of it. Creating conference experiences is the key to what all who are involved with meetings need to focus on. Interactive keynote speakers are a must for events! 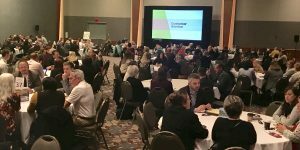 In an article in the February 2019 edition of Meeting Professional Magazine (from MPI) I wrote about my client, the National Tour Association and how they changed up their opening session from a keynote to an interactive facilitated discussion with hundreds of participants sharing their answers to their industry’s most pressing questions. This change brought with it some risk, but their members enjoyed the fresh approach. It allowed them to meet new people, share business experiences, and learn from the brilliance of their fellow members. (Digital Link to the article, titled “Try New Things”, is not yet available). It has become common for meeting organizers to ask me, as their speaker or master of ceremonies, if I would be willing to “play” with a unique idea. The American Public Works Association created a morning game show where those who arrived at the general session early, and sat near the front, had the opportunity to win cool prizes. I was the game show host, and ran around as if it was a recreation of “Let’s Make a Deal”. People sat near the stage and enthusiastically engaged in the simple but industry relevant themed game. The “Connecting with People in a Gadget-Crazed World” presentation that I have delivered over the years at association and company meetings has a section called “The Power of Hello”. In the middle of the talk (not up front) I make participants leave their area and meet one or two people in the room whom they have never met before. One would think this would be something people are familiar with at conferences, but I present the exercise in a unique manner, and it quickly becomes a turning point for the whole event. People get very plugged in with how at an event they control their own outcomes by whom they choose to engage with throughout the conference. The culture of the event gets changed and it becomes all about interaction. I hear from attendees and planners long after the event that this little piece of my presentation was their “ah ha” moment. This is because they were active not passive in the learning. The keynote I introduced in 2018, “The Paradox of Potential” has an element of a child’s “choose your own story” book. I let the audience share in small groups what they believe holds people back from reaching their highest levels in their industry, and the answers they share change the direction of the rest of the keynote. Too many speakers could deliver the same talk word for word to plumbers, meeting planners, lawyers, and chefs. There is not only little customization, but the people in the room have no input. As events continue to evolve, the role of speakers is changing too. The best speakers I know are no longer just showing up, talking, and leaving. Meeting organizers and audience members want speakers who will be part of the conference community before, during and after the live event. Speakers need to engage, not just be a “sage from the stage”. The celebrity speaker is always nice, but they rarely stick around to talk to people. Experiences are the goal, and I look forward to working with new clients that want to “play” with ideas that engage people.